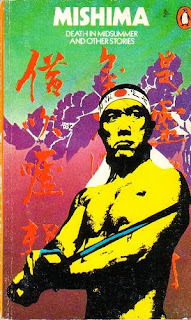 Death in Midsummer and Other stories is a short story collection by Japanese author Yukio Mishima. The first story gives the book its title. I've only read the first story and I loved it. I'll write about the other stories, updating this post as and when I read them. Death in Midsummer is translated by Edward G. Seidensticker. On a family vacation at a beach resort, while Tomoko Ikuta is taking a nap in her room, her three children and their aunt Yasue are on the beach. A freak accident leads to the death of Yasue and two children. The story is about what's left of the little family dealing with their sudden loss. The story is frank and simple. It is more like a chapter out of someone's life; without a real plot but in a way, complete. In contrast to the helpless feeling that Ishiguro's stories brought, Death in Midsummer is precise. The way the characters deal with death and family is very real. The relationships between the characters, the husband and wife are at once delicate and strong. They aren't always able to understand each other or are puzzled by how they both react to a same situation in two completely different ways. Their reactions are described with a calm lack of drama, that very few books about loss manage, and I could relate to it perfectly. The writing is shockingly vivid. I hope to read more stories from the collection soon. In the meanwhile, if you like Japanese Literature, check out this challenge. Hey Harish, I'm sure you'd enjoy this. I did have a bad experience with Murakami when I tried reading Norwegian Wood... but that's just me. I look forward to your review of the collection you have. I really agree with you about the way the stories seem complete in their simplicity, that is something Japanese literature has taught me (that a plot is not necessary). Often we see the characters in a brief period of their lives, moving in and out as casual observers, and yet there is often something to be learned from their actions or feelings. I've just found a new appreciation for Mishima with The Sound of The Waves, after feeling dissatisfied with The Temple of The Golden Pavilion last year, now I want to read this book you've reviewed for us. This sounds like a story I'd love, given how you describe the way the characterizations and relationships are handled by the author. I've been reading through an anthology of world lit, and came across some wonderful Japanese stories, one of them by Fumiko Hayashi (called "Downtown") that handles the short love affair of a poor man and woman with a light and gentle touch that nevertheless shows the power of their connection - and ultimately the devastation of how everything ends. But no melodrama. Just this kind of gentle, careful touch. I will keep this one in mind. Short stories, I do like. Harvee - I hope you do get around to reading it! mel u - He is one of my favourite Japanese authors now, too, though I can't say I've read many! Bellezza: I have heard a lot about The Temple of The Golden Pavilion, but I haven't read it yet. I saw The Sound of the Waves at my library, so now I know what I'm reading next! Thanks for stopping by. HKatz: And that sounds like a story I'd love, I'm going to jot down the name and see if I find it at the library. As I'm beginning to discover, most Japanese stories have this subtle emotional touch. Glad you stopped by!